Same-day washing machine repair of all types and common brands. Convenient scheduling online and by text message. Plus, FREE house-call with your repair. Dependable washing machine repair by certified technicians for a brands and styles. Accepting appointments 24 hours a day, 7 days a week, for no extra charge. Call, text or schedule an appointment online. It’s our goal at FIX Appliances CA to make life easier for you. We’ll work around your schedule and work quickly to ensure your complete satisfaction. Each member of our repair team is licensed and insured, so you’ll know your washing machine is in good hands. Same-day service is available, and your house call is free if you order repair work. What have you got to lose? Call FIX Appliances CA today in Barrie and Simcoe County at 705-300-2380 and in Toronto Area at 647-503-6655. Enjoy this special offer for your washing machine repair. Save $20 on Washer Repair For new customers only, for washing machine repair. When I called about our machine leaking they were able to send a service repair man within hours of the same day. He determined the problem, called in for the part and within the week ( a couple of days) the machine was fixed. This company was very accommodating in getting the repair done as soon as possible and their service person was efficient and professional. I would use them again if the need arises. FIX Appliances CA has branches in different locations. 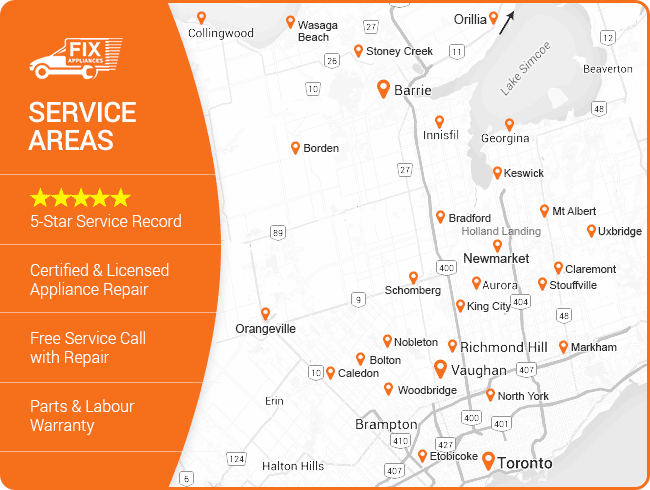 Our technicians cover Barrie and Simcoe County, Toronto and the Greater Toronto Area. Check the map to confirm the service area nearest to your city or town. 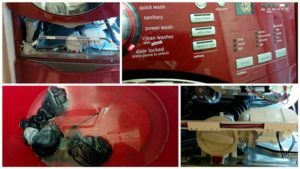 What will happen if my washer isn't level? It is extremely important for all washing machines to be level for proper operation. If your machine is out of level, the machine will run off balance and damage the unit. Which is more efficient, a front-loading or top-loading washing machine? Although front-loader machines can be more expensive initially, the cost can be regained in the savings of water, sewer, drying time and soap usage. How full can I load my washer? Top-loading washing machines can be filled to the top of the agitator with loosely layered clothing. Top-loading without agitators can be filled to the top as sensors in the machine will determine how much water is needed. Front load machines can be filled until the entire tub is full, with minimal compression of the clothes. Why do I still have soap suds left at the end of a wash cycle? 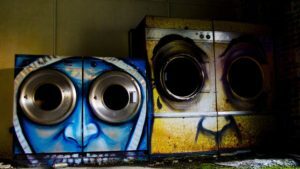 You’re likely using too much detergent for the amount of clothing in the machine. Try using half the amount of detergent to see if the problem is corrected. You may need to increase the detergent slightly if the clothes aren’t coming out as clean as they should. Is it really necessary to wash clothing inside out as many manufacturers’ suggest? While newer machines without an agitator reduce the amount of abrasion on the fabric, turning the clothing inside out may extend the life of some fabrics and any enhancements such as embroidery or decals. It will not affect the cleaning action of your machine. This is a critical issue for both high-efficiency front-load and top-load machines. Always use the minimum amount of HE detergent (1-2 tsp per load). Because these machines use less water, using regular detergent produces an excess amount of suds and can allow film build-up on the drum and hoses that can lead to damage. It may even void the manufacturer’s warranty. If you use single-use pods, make sure to place them in the bottom of the drum (never in the dispenser) before adding clothing to allow the longest amount of time in the water. 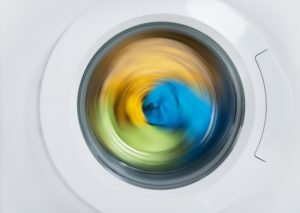 Leaving damp clothes in a machine will breed musty smells and mildew. Leave the door open or ajar to improve air circulation when not in use. This will also prevent mold and mildew buildup. Detergent residue builds up inside your high-efficiency washing machine. To eliminate musty odors, run a wash cycle with white vinegar (in the dispenser) and one cup of baking soda (directly into the drum). Run the machine at the highest temperature and add an extra rinse. Stubborn mildew smells can be eliminated by using bleach in place of vinegar. Clean the door seal regularly with a 50/50 solution of white vinegar and water to keep it pliable and sealing tight. The drain pump filter can become clogged from a buildup of hair, fabric and other small particles. To reduce problems with water drainage, excessive vibrations or longer cycle times, remove the filter and rinse it out bi-weekly. It is usually located behind a door at the bottom/front of your machine. Flood damage from a burst washer hose can be extremely expensive. Check for signs of wear or weakness a few times a year. Replace the hose if you find any cracks or blistering. It’s recommended to use stainless steel hoses and replace them every five years.